Dr Shah is an economist and public policy specialist. He is a Senior Fellow of the Colombo-based International Water Management Institute and a former director of the Institute of Rural Management at Anand in India. He serves on the boards of several academic institutions and NGOs and is a director on the board of the ICICI Bank. 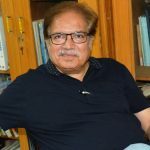 Over the past 35 years, Dr Shah’s main research interests have been in water institutions and policies in South Asia, a subject on which he has published extensively. His notable contributions have been in comparative analyses of groundwater governance in South Asia, China and Mexico. More recently, his interests have been in comparative analyses of water institutions and policies across Asia and between South Asia and Sub-Saharan Africa. He has also worked extensively on the energy-irrigation nexus in India. In 2002, Tushaar Shah was honoured with the Outstanding Scientist award of the Consultative Group of International Agricultural Research (CGIAR). We are pleased to acknowledge Tushaar Shah’s personal contribution to the enhancement of policy and governance for groundwater protection worldwide with this award.